I promised to post some thoughts about the Economist fertility article so here goes. Remember, I am NOT a social scientist; but I am an employed mother of one child who has traveled widely. There are several assumptions in the Economist articles that I do not believe are proven by the facts they presented alone. First off, the fact that some European countries have higher birthrates than others (e.g. Spain, Italy and Germany) may not be because marriages in the first group of countries are more egalitarian or that their laws and workplaces are more friendly toward mothers. Look at this table of estimated 2007 global fertility. Mali, Niger, Uganda, Somalia and Afghanistan are the top five. High fertility does not represent egalitarian treatment in any of those countries. The Economist states that France and Sweden experienced a recent uptick in birthrates and concludes that it is due to mother-friendly laws in both countries and more egalitarian marriages in Sweden. On what basis can they make this claim? Has anyone asked women why we do or do not have children? Germany has the most childless women in Europe. Let's use the way-back machine to the summer of 1983. I was an exchange student staying with a family in Germany with three kids and a professional mother. Germany is the country cited in the Economist article as having the most childless women in Europe. How did my host mother do it? She did it by marrying a much older man when she was an university student. My host father told me that she was incredibly beautiful and all the men in their apartment complex were after her, but she wouldn't give any of them the time of day. He told her that, if she married him, he would quit work and stay home with the kids. Moreover, he had quite a large sum saved up and would build her a live/work situation in the location of her choice. He was a man of his word. Each morning, she prepared a cold breakfast and ate with us before heading downstairs to work. Then I walked to school with the eldest daughter, a girl slightly younger than me. (No need to chauffeur any of the kids if one lives in an urban village.) Her husband stayed home with the two sons that were too young for school. Her mother lived in the apartment above hers if he needed any help. A cleaning lady came in once a week to clean, do laundry and stock the pantry. She walked upstairs for lunch and returned downstairs to continue work; she joined the family for good at dinnertime. All was not perfect, though. Back then, Germany had strict laws about when stores could be open. Thus, shopping is nearly impossible for working people. Yet, I never saw the father shop for groceries or household goods. (Come to think of it, I never saw him clean or do laundry either. He was very involved with the kids though.) One morning, she noticed that I was up early (jet lag) and she told me to go with her. We walked to the grocery store right at opening time. I helped her carry the groceries home and put them away. I watched as she prepared breakfast for everyone as the household slowly awoke and came to life. I could see that she had a very long workday. It worked for that family. However, marrying someone 25 years your senior and with lots of money is not an option for all women. Germany needs to come up with something better than that. After I said good-bye to the German family, I took the train to Sweden to spend two weeks with the family of an exchange student that had previously been at my high school back in California. I sharply recall the conversation at the family Sunday lunch with the parents and all three children. The eldest daughter lived with a boyfriend who worked at the same office she did, in a slightly more senior position. They had lived together for several years and the parents were asking her why she didn't marry her boyfriend. I could tell this was a frequent topic and she didn't want to discuss it again. The guy in question just sat there at the table, not helping her deflect her parents' attack. Why did he say nothing? Why didn't she want to marry? Fast forward to 1993 when I met a couple who married after 10 years of living together. They had met at the office. The recent bride told me that getting married after living together for so long is just getting "permission to have children". Then I realized why my friend's sister didn't want to marry the guy who wouldn't stick up for her. Perhaps the reason that so many Swedish children opt to have children out of wedlock is because of workplace discrimination against married women. Unlike the US, they are not penalized in figuring pensions or child support if they do not marry the father of their children. Hence, marriage offers Swedish women no carrot, just a stick. No wonder so many children are born out of wedlock there. For Sweden, the forecasts say the population will grow by about a fifth. Some of this is the result of immigration and rising longevity but, according to David Coleman, a demographer at Oxford University, the recovery is also the result of older women having more children “almost sufficient to compensate for the sharply reduced birth rates of younger women”. This is exactly what was hoped for, but does not seem to be happening yet, in the Mediterranean and eastern Europe. If you take account of late childbearing, you find that 16 European countries, with a total population of 234m, now have fertility rates of 1.8 or more. [snip] They are rare examples of bucking the trend that, as countries get richer, their birth rates fall. Why? There are no obvious answers. The French run policies to increase the birth rate; the British do not. Most high-fertility countries are high-tax, high-welfare ones (France, the Netherlands, Scandinavia). But so is Germany, and its fertility has been declining for decades; whereas Ireland is not, and its population is growing. Maybe Ireland and France are responding to Catholic teaching on big families? Hardly. Remember Italy and Poland. Though it is hard to be sure, the most plausible explanation is that some countries have struck a successful balance between life and work that enables parents to raise children without sacrificing their careers, and that this encourages child-rearing. If the explanation is right, it does not matter that France doles out presidential medals. But it does matter that it has an excellent, state-subsidised system of creches, to which mothers are happy to entrust their offspring. How do they know that the late childbearing by Swedish women is not due to them hitting the glass ceiling and then "opting out" like many affluent American women? How do they know that French women with more children remain in the workplace because of the availability of subsidized childcare and not other reasons? The Economist article also discussed the gap between the desired and actual total fertility of women. A survey by Eurobarometer, the EU's pollsters, for example, found that women who had finished bringing up their families said they had wanted (on average) 2.3 children. But they actually had only 2.1. Perhaps they were not answering truthfully. But the evidence does suggest there is a mismatch between desired and actual fertility. Delayed marriage can lead to fertility problems. Where women are punished in the workplace for marriage, they delay marriage. One needs only look at Japan to see this. To understand the fertility problem, we need to look deeper and earlier. We need to look at the global disincentives for women to marry. Why is marriage so punitive towards employed women? 2.1 total female (lifetime) fertility is not the magic replacement number for all situations. The number depends upon the maternal age at birth and mortality statistics. In two populations with the same life expectancy and total fertility rate, the one with younger mothers, or a shorter generation length, would grow faster (or decline more slowly) than the other one. Draw out family trees with branch length along a time axis to prove it to yourself. I wanted to also blog about an article from the front page of the Sydney Morning Herald on October 20, 2003 entitled, "Why the one-child family is looking good to women". However, I have run out of time. The article discussed the findings of Lyn Craig, an Australian researcher who studies "the gendered time impacts of children, motherhood and equity, work-family balance, the division of domestic labour, fertility, and comparative family and social policy." Click on her current research topics to see a list of worthy questions. Looking around Sweden, 24 years ago, I noticed that women were predominantly in low-status, dead end jobs. My friends sister was the first woman I met in a professional job other than a school teacher. I read that women have made inroads into professional jobs in Sweden. But I wonder about the marriage and motherhood penalty. I hope to visit there again and find out. In knitting and sewing news, I have very little to report. I sewed ties to the inside of our guest room duvet. In true imperfectionist style, I used what I had on hand rather than going out to buy cotton twill tape that matched. Who cares? It is on the inside. I even didn't change the thread in the sewing machine. Iris' Latoya-inspired tank is half-way done. I ran out of yarn and it is discontinued. I scrounged in the stash and found a pale blue cotton that coordinates well, but is in a lighter gauge. I hope to hit the desired gauge by tripling it. In the 5S department, I went through the huge stack of shelter and fashion magazines that had piled up and cut out the items that I wanted to save. I put them all into binders along with the cuttings saved from the last two years, the last time I did this. Whew! No wonder no gardening got done this weekend. I am just going to call the weeds mesclun and hope no one has a clue. Relationship of fertility and generation length to population change. I blog about birthrates way too much. Click on the Birthrates tag below or to the right to read other posts. What do I tell her? More thoughts on the price of motherhood. I wrote about the French motherhood utopia in Perfect Madness. Have you ever stared at a "Made in XYZ" label and wondered what that means? What information does that capture or not capture? Greg Linden, Kenneth Kraemer and Jason Dedrick of UC Irvine wrote a report entitled "Who Captures Value in a Global Innovation System? The Case of Apple's iPod". Their analysis was surprising, both in their findings and what they were unable to discern. Manufacturing with a global supply chain is a very complex issue. Now I don't feel so weird for wondering. Mark and I debated the merits of returning to vacation spots versus exploring new places. We decided that we couldn't decide. Well, he is more for the latter and I am split evenly. I don't find revisiting places boring at all. There are always subtle changes. 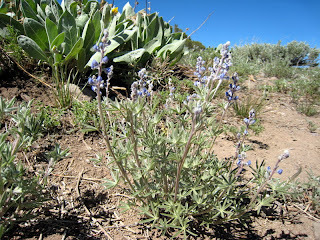 The lupines, and all the wildflowers, up at Sonora pass look so dessicated this year, compared to last year (normal precipitation) or the year before (record high precipitation). Returning to old stomping grounds also give me a sense of place. When I see the lupines on the highway by Camp Blue Road, I know that we have arrived at the lair. They were less abundant this year than in the past. The trees had also been thinned and the forest floor cleared with a proscribed burn. If the lair can avoid the fate of South Lake Tahoe, it will be worth the effort. Click here to see the smoke plume from the Angora Fire, captured by the NASA Aura satellite. 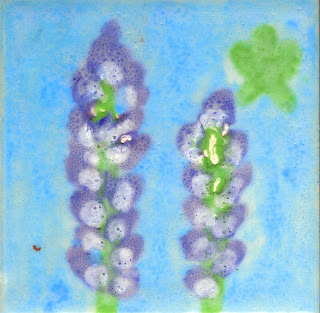 By coincidence, Grandma Ann over at Sitting Knitting wrote about lupines while I was busy painting lupines on my Lair commemorative tile. The old kiln gave the new art shack counselors a great deal of trouble. They couldn't get the kiln to a high enough temperature for long enough. Hence, the clear glaze came out milky. 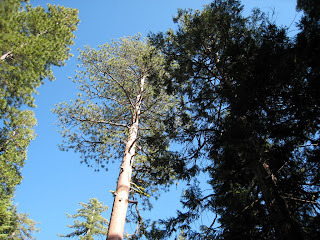 Almost every day, I hiked up (and up!) to Vista Lodge. Usually, I joined others for yoga, Pilates or dance class. Sometimes, I would arrive early with a book. Always, I stayed late, dragging my mat to my favorite corner of the deck. I lie in the dappled alpine sunlight and look at this. My mother says that I should be able to meditate while staring at a blank wall. 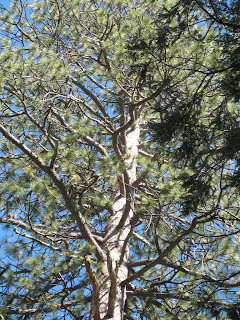 I prefer to look at the branches of this tree. Jason Snell made a liar out of me. I told my boss that I was going to the mountains with my family. Don't bother trying to get in touch with me. I will not have internet access. Cell phones don't work up there. See you on Monday when I get back to the office. Then Jason Snell wrote an opinion piece about the Lair in the current issue of Macworld. For me, and many others, Lair is about reading actual print (books and magazines that have piled up around our homes) and talking face to face with other engaged readers. I want my uninterrupted reading and chatting time. I do not want to be wired and connected. Jason, my boss reads Macworld. I subscribe to the one carrier that gets reception at the Lair. Now he knows that I could have turned on my cell phone and checked my email all along. If my boss is reading this, I would like to add that the wi-fi is slow as molasses (worse than dial-up!) and that the Lair is extended network and ultra-pricey. We improvised quickly. We got the word out for staffers and campers to bring laptops to the theater. I brought my iBook and my slides on two USB thumb drives. We loaded up the talk (in either pdf or ppt format) onto the others' laptops. At each talk, campers clustered around the 4-6 laptops in the audience. I sat facing the audience with my laptop in front of me. I said click whenever I switched to the next slide (and read the title of the next slide). I actually welcomed the informality of this setup. It fostered a more interactive discussion. I am not fond of standing in front of a big screen. I am still slightly traumatized by the time, a few weeks ago, when I said "multi-variate optimal interpolation" in front of a room full of NASA administrators and they all giggled. We read a great deal while at camp. Camp is highly child-centered with kids running feral in the woods with counselors and all parents watching out for everyone's children. Renewing friendships with other families returning to camp is like watching time lapse photography of our children. What better setting than that for reading the Economist's take on European birthrates? The article is highly worthy of reading in its entirety. I would like to post more about it, but after we are done with unpacking and laundry. Here are a couple of tidbits. Italy has no more childless women than France and Sweden, countries with much higher fertility rates (see table). But more Italian mothers have just one child. The pattern is still more marked in Russia, where a third of mothers have a single child. One possible explanation is that, squeezed between family obligations from the past and current social arrangements which limit job flexibility or cheap child care, many Italian and Russian women are reacting by satisfying social pressures to produce a family to the smallest possible extent—by having one child. Such a reaction may be hard to change. I can't believe that we leave in less than two days. I have so much left to do before we go! Add house guests, delivery of our new (to us) car, end of year school activities, a deadline for submittal of our research proposals for the next fiscal year, a semiannual progress report for another project, and a new computer (with a switch of operating systems) at work; there are not enough hours in the day. What got over me, volunteering to give the fireside talk next week (to explain what we do and do not know about global warming/climate change)? I must have been nuts. I need my superhero powers now. Mark volunteered to start packing up the minivan after Iris' school concert and registering the new car tomorrow afternoon. So I am leaving him the link to my unofficial Lair packing list. While he is at it, he should check the official Lair packing list. I need to add my hiking sticks to the packing list. My orthopedicist was not kidding. They are a must have for long hikes. Will there be enough room in the minivan after we put the tandem and Iris' tagalong bike for some PVC pipes? I want to try Shibori at the craft shack. I finished Latoya, a cabled tank pattern from the Berroco website. Compare mine with theirs. I made several modifications to fit me and my yarn. I am mostly happy with it, though I may need to shorten the straps. The tank pattern as written has a 45 stitch 3x3 rib pattern in the middle beginning and ending with a P3 on the RS. The side panels are written as reverse stockinette on the front and regular stockinette on the back. That would look weird. I made side panels stockinette all around. However, I think it might have looked better if I used reverse stockinette on the sides. The cable directions are confusing, but they are correct. The most confusing part for me was that, when you pull K3 stitches across P3 and K3 (6 sts total), then the P3 stitches will become K3 and the remaining K3 will become P3. Then K3 sts from the cable needle. The front (left), back (center) and inside back (right) are pictured below. See how the ribs really pop on the reverse stockinette side? If I were to make it again, I would have made the side panels reverse stockinette. I used a different yarn with a different gauge. sknitty posted a method for adjusting sizes for different gauges. But, I was a math (and chemistry double) major and we are notoriously bad at arithmetic. I do something even simpler than her method. My bust is 34.5" and I want my sweater to be about 34-35". My yarn had a gauge of 17 sts/4". The pattern calls for 18 sts/4 ". My yarn will yield a bigger sweater than the pattern so my ratio needs to be larger than 1. 18/17 = 1.06 I then multiplied the smaller size sweater, 32"*1.06 = 33.9". I knit in the round so the 4 seam stitches will add almost another inch. As you can see from the top photo, it fits. I knit in the round with stockinette side panels. I eliminated 6 stitches in the front panel and the 6 rows where I would have reduced them. That shortened the sweater by 1" at the bottom. I did 4 rows of garter stitch at the side bottom edge before switching to stockinette stitch to reduce the curl; the pattern has straight stockinette all the way up. The pattern's shoulder straps are 8 stitches wide in garter stitch. Garter stitch can really stretch out, which would not be good in a strap. Besides, I wanted to continue the rib design on the straps. I made mine 9 stitches wide, continuing the K3, P3, K3 (from the right side) pattern of the body. In the back, I decreased at the armholes as suggested in the pattern, one stitch at each side on each right side row. In the front, I bound off one stitch at the beginning of each row which makes the front 4 rows higher than the back. I adjusted the strap length by trial and error, putting the live strap stitches on waste yarn that was also run through the back top edge. At first, I thought it was too tight so I added another 2" or 12 rows. After washing and blocking, I think I should have added only 1". The straps tend to slip down repeatedly. I grafted the live strap stitches to the bound off top back edge. The whole sweater could have been knit in the round, even in reverse stockinette, with the inside out. You need only do the cable maneuvers from the reverse side. The center panel would then by 39 instead of 45 stitches wide, beginning and ending with a K3. Then, you could move the straps inwards by 6 more stitches (K3, P3, K3) to keep the pattern continuous. That would also reduce the strap slippage problem. If I were to make this sweater again, I would have started the cabled part 1-2" later than the pattern instructions. YMMV. Iris asked for a sweater like this. I will change the 3x3 rib to 2x2 rib to scale it down to her size. Cut the working yarn, thread through a needle, pull the yarn through the last knit stitch from the back of the stitch toward the front. Leave the stitch on the needle. Go through the back of the corresponding stitch on the bound off edge. Now go back through the front , toward the back, of the first stitch on the needle. Let that stitch drop off the needle. Go from the back of the stitch on the needle, toward the front. Stitch from the front toward the back of the first bound off stitch (you sewed through this once before from the other side), then sew from the back of the next stitch. Repeat for the rest of the knit stitches. When you get to the purl stitches, begin by stitching from the front to the back the first time. The second time you go through that stitch, go from the back to the front. If this is confusing, try working the purl grafting stitching from the back. Then you will be grafting knit stitches! Be sure to push the lump of the bound off edge towards the inside. Keep going. Adjust the tension gently with a knitting needle until the join is invisible. 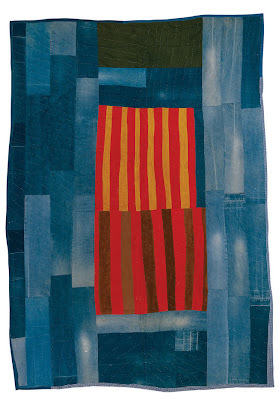 I close with a picture of a quilt by Annie Mae Young from The Quilts of Gees Bend exhibit. I found the variation of blues in the old work clothing quite visually arresting. Thanks for sticking around to the end of this long-winded post. The fiber demo was a bit of a bust. We watched volunteers spin and card wool, angora and silk--but no plant fibers. We asked where we could see the dyeing demo. Dyeing? That was only yesterday. Today, we are not doing any of that. Sigh. The schedule did not make that clear. Iris and I did see an indigo plant at left (with the pink flowers). The yellow composite is chamomile. 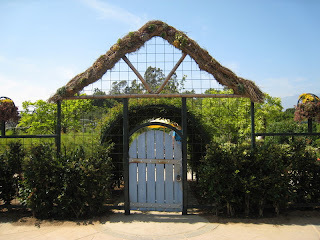 After we saw the rose garden in its full June glory, we headed over to explore the new children's garden. See the child-sized gate? Getting Iris out of that garden was difficult, especially with the dangerous characters roaming in the garden. 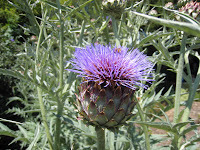 Have you ever seen an artichoke at this stage of development? It sure looks like a thistle now. 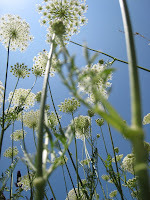 Bees were abundant, I am happy to report. 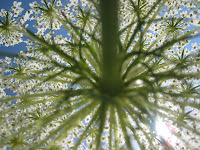 Inspired by Deb, I pointed my camera upwards. 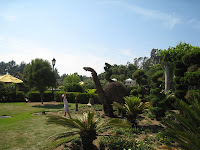 Afterwards, we went to the Pasadena playhouse district for dinner and browsing at Vroman's bookstore. I even paid full price for The Structure of Scientific Revolutions, an impulse buy. 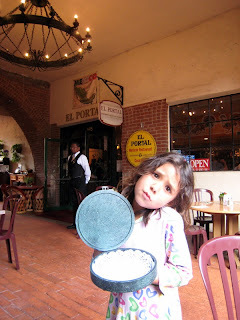 This is how Iris asks for more tortillas at El Porto, a Yucatan-style Mexican restaurant we favor. Mark and Iris saw Shrek the Third yesterday. She calls it her "Puss in Boots" eyes. Do you think it worked? The room has north east exposure and faces the street. Here is the view toward the northeast. This is such a vast improvement over the last floor plan. There is actually room to move around the cutting table, even when both leaves are extended. The top picture is a closeup of the Indonesian copper tjaps (for batik) on the east window sill. My knitting, crochet and miscellaneous crafts books reside in the left closed cabinet. 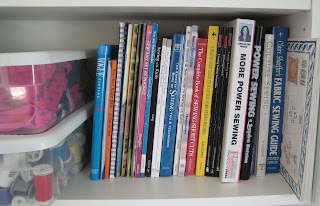 My sewing reference books are in the open shelves above the sewing machines. 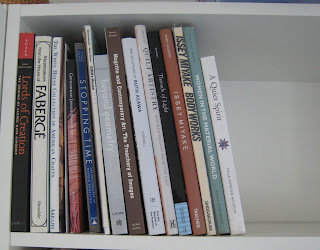 Sewing and quilting magazines reside in the right closed cabinet. Some art and inspiration books. The South wall has the door and a 9' wide closet with mirrored doors. It holds the majority of my fabric and yarn collection, but there is spillover in the bins under the sewing table, by the north window, and under my bed. 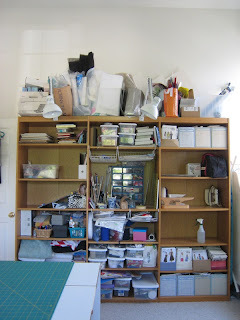 See Deb's bookshelves and studio. Mardel shows some of her bookshelves. 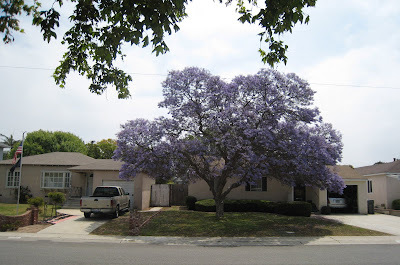 I took a picture of my favorite Jacaranda tree last week. It is one block south of the shipping container house I blogged about earlier. It sounds cool when I tell people I live in an urban infill neighborhood. I live in a two story townhouse sandwiched between a 2-story apartment building and a one-story house. But think about how the people in the original one-story houses feel when a three-story house, stretching right up to the 5 feet setback, goes up next to them. There is an alley behind the two new tall buildings. What is the excuse for putting the garage and ocean of concrete in front? If you came from the Dream Home Diaries Blog, you may want to view a discussion about Atlantic Hurricanes and Anna Maria Island. Or more about Shipping Containers. Don't miss this moving story by Kitty Felde (of KPCC). 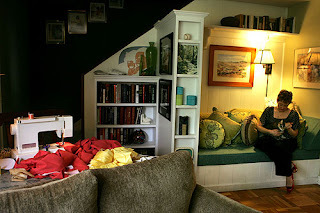 She wrote about her sewing buddy, Mary O'Donnell, and their quest for the dream sewing space. Click here or on the photo to go to the LA Times story. 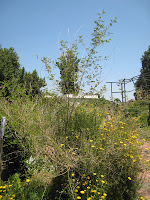 I received this email from the Huntington Library and Gardens. Their web site has general visitor info, but did not mention this event. It is listed under family activities so I told Iris about it and she wants to attend. I also want to see the rose garden in full bloom. Somehow, she thinks they are going to dye flowers instead of dye fiber with flowers. I tried to clarify, but dyeing flowers really captured her imagination. Perhaps I will show her how to dye carnations with food dye at home one of these days. June 9 - 10, Sat. - Sun., 10:30 a.m. - 4:30 p.m.
We finally have usable workspace that does not require moving piles of stuff from one surface to another. The walls, now that we can see them, sure look white. I need to hang up some of the artwork stored in the closet. We have been experiencing sporadic internet outages in the months since Time Warner Cable took over from Adelphia. Calls to customer service elicited nothing more than instructions to reboot the cable modem and the computer. That was inconvenient, but usually solved the problem. However, since last weekend, we have had sporadic internet connectivity. That is, we have had internet outage with only very short periods of internet connectivity. First, we were told that our area was experiencing an outage and that there was nothing to do but wait it out. Later, they said that the problem was in our wiring and that they would send someone out to repair it on Thursday. Thirdly, we were told that the outages were due to old Adelphia software that had not been deleted from their end. They said they deleted the Adelphia software and installed Time Warner software. What does any of this have to do with the title? Is it a Bohrbug or a Heisenbug? A Bohrbug can always be replicated with a specific combination of events. A Heisenbug occurs sporadically in response to a set of not well understood and replicable computer and network states. We are not sure yet; the tier 2 troubleshooter gave us a ticket for sporadic outages. Just in case, we are holding on to the appointment for someone to come test our line. In grad school, my research group discovered a floating point error in a new computer chip. Molecular dynamics simulation code from our group became a standard floating point test for the computer manufacturer. It would be nice to be able to pick up the phone and speak to a level 3 or higher engineer/troubleshooter whenever I had a problem. But, I would not like to experience the number of problems that would get me flagged as someone who only calls about extremely difficult problems. Such is life. Iris has been reading Nancy Drew books obsessively. She can read one each weeknight and two on a weekend day. She asked me if I wanted to be a sleuth. I told her that I am one. She said, "No, you are a scientist." I served on an independent review team (IRT) this Spring for a project that is over budget and behind schedule. (I finally had a chance to brief a general but had to turn it down due to schedule conflicts; I had to be in 3 meetings and a birthday party on two coasts that day.) She (the general), also wanted us to outbrief the reviewees as a courtesy. This morning, we did that (only 1 kilometer from Iris' school! ), giving them our recommendations and giving them a chance to respond. The review findings will then be passed on up the chain of command. Maybe, we will have a positive effect, maybe not. I have never served as a member of an IRT before, though I have done a technical study for one. One thing that struck me while sitting in the presentations made to the IRT in our investigation is how often the same problems recur. They happen so infallibly, in a variety of projects, that I wonder if the true problem is that we do not properly plan for them. For instance, take that budget spending chart that has dates along the horizontal (project start at left, end at right) and dollars along the vertical axis. The graph looks like a straight diagonal line from 0 at the bottom left and the budget limit at the top right. The actual spending is plotted over the straight line. Any deviation must be corrected to get back to the straight line. Let's not discuss whether a straight line is realistic for software delivery schedules. Year after year, we saw them get behind in July. I asked why and was told that it was summer vacations. There were also smaller dips during the holidays and spring break. So, why don't they adjust their spending plan and work schedule to account for the fact that people have lives outside of work? We are treating a Bohrbug as a Heisenbug. That was one of my recommendations. But it got reworded into something unrecognizable (by me). The stuff diet continues. We are getting rid of things we no longer need. We are also adding more storage so we can easily get at the things we need. I spent the day going through stuff in the home office/guest room and the sewing/exercise room. Mark has been assembling and hanging IKEA kitchen wall cabinets and shelves in both rooms. The dust and mess kicked up by this process is unreal. I will post pictures later, when the office is put back together. This evening, we discussed a different furniture arrangement than I had previously sketched. Why is this a big deal? I had arranged things in the shelves based upon where they would be used. If the furniture is placed differently, then the stuff needs to be arranged differently. All that work today might be for naught. Seiri (Sorting) is throwing out what you don't need and Seiton (Straighten) is arranging items so that they are ready when you want them. Arranging things neatly is only Seiretsu (lining up in rows) and proper shop floor management requires Seiri and Seiton. Ohno further explains the correct meaning of Seiton. The "ton" part of that word means "right away" or "immediately" and suggests that when you do the second S (Straighten or Set in order) this means it is in the place where you need it and accessible immediately. If you need to move other things out of the way to get at it, you have not done Seiton. Chances are, you haven't really done Seiri either and there's more there than you need. Since I was a little girl, I put things away before going to bed. I slept better that way. I am also more productive in an orderly environment where my tools are ready where I need them. Mark and Iris appear to be missing that gene. One day, when I was too tired to straighten up Iris' room for the nth time, I told her to do it on her own. She looked at me and said, "Mom, I like it messy. Why can't you just accept me and my mess?" Perhaps because you are allergic to dust and you can't breathe in your own room? Read her father's take on mess. We saw the Joe Orton play, Loot, last night in Glendale. Even though the play was written 40 years ago, in another country, it is extremely topical. See it before it closes this weekend. Read the rave review in the LA Times. Hire a babysitter. Joe Orton's humor is not suitable for young children. There are limits to my lax parenting.